This is the first of a series of initially 5 posts in which we – Fabiana Kubke, Daniel Mietchen, and anyone interested to join us – are planning to reflect on a number of projects related to science in the digital age. We have applied for (and admitted to) the Getting your CC project funded course at P2P University that started today and is scheduled to help participants on their way to submission-ready grant proposals by mid-July. The underlying assumption is that open collaborative environments would have a positive impact on science and the relationship between science and society. The ultimate goal of defaulting to ‘open’, as Eisen suggests, requires suitable (and sustainable) collaborative environments with low adoption barriers. The initial focus must therefore be on how to ‘build’ those environments (or on how to re-purpose existing technology to serve this goal). 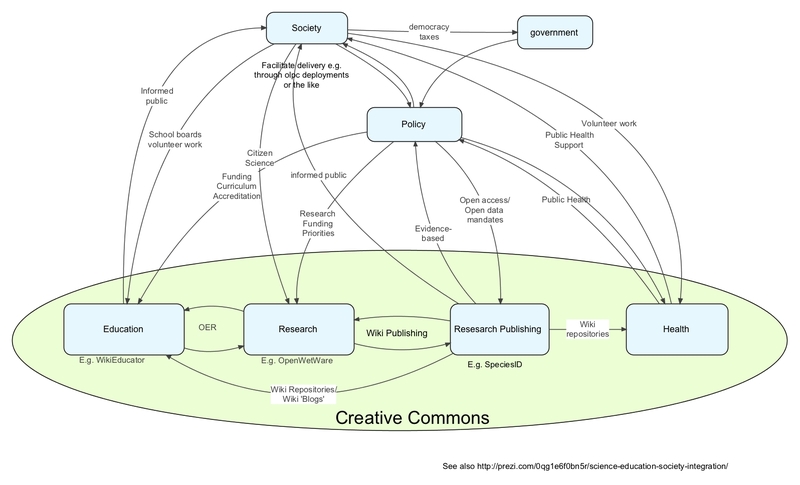 One place to start is by making existing scientific literature licenced under Creative Commons (or other open licenses) available in ways such that it can be edited, updated, commented upon and re-purposed. The goal is to shift the scientific literature from its current static format to a more dynamic one that is more aligned with both how science is done and how information is used. We see science as providing information; but that information can only be transformed into knowledge when the different spheres of society can interact with it in a usable manner. One crucial initial step is to make the information available in a way that allows diversifying the ways in which information/knowledge is being put to use so that it can have the desired transformative effect. How are we planning to achieve (some of) this? One proposal on how to achieve openness in scientific information was led by Daniel Mietchen and took the shape of the COASPedia project that aimed to “demonstrate to the scientific community that scientific articles published online under CC-BY-licenses can be arranged in a different and — importantly — more efficient manner than those published in classical journals.” The COASPedia project – initially presented at COASP 2010 – was a finalist in the Wissenswert initiative of Wikimedia Deutschland, but did not get funded. We have now signed up (and were accepted into) a course on “Getting your cc-project funded”, run by P2PU. The course starts on April 26th, and we will be working on expanding on the original project during the course and after and drafting a proposal to get the project funded. To be admitted into the course we had to offer 3 ideas; each will specifically be described (and opened for discussion) in each of the following posts. They all sit around the concept of a basic repository (whatever shape this may take). This basic framework of our ideas for the course is not too different from what was proposed in the original COASPedia proposal: What we would like is for information to become useable, findable, and linkable while still capturing not only the original work but also the different contributions and their authors (i.e., preserving the cultural heritage of science). The 2 other ideas sit more specifically around how the usability, findability and linkability can help transform the way we relate with the information at hand. In the spirit of openness, we will keep the entire drafting process as open as possible, so as to invite feedback and other contributions from early on. In order to help us identify the platforms that are best suited to a collaborative writing process of this kind, we will use this series of blog posts to experiment a bit with several potential drafting environments. An aggregated view of the project will be maintained at https://tuhura.fmhs.auckland.ac.nz/mahara/view/view.php?id=295. We will link directly where possible, and use the endnotes mainly to store the metadata of some key references. Quote was taken from Freire, P. (1985). Pedagogy of the oppressed. Harmondsworth Middlesex: Penguin. A website devoted to this work (http://www.pedagogyoftheoppressed.com/) has useful information on both the author and the text. Radder, H. (2010). The commodification of academic research : science and the modern university. Pittsburgh Pa.: University of Pittsburgh Press. An article along these lines of thought sits in SpeciesID and in Nature Preceedings.